Susan Heim on Parenting: Fuller House: The Complete Third Season ~ Now on DVD! 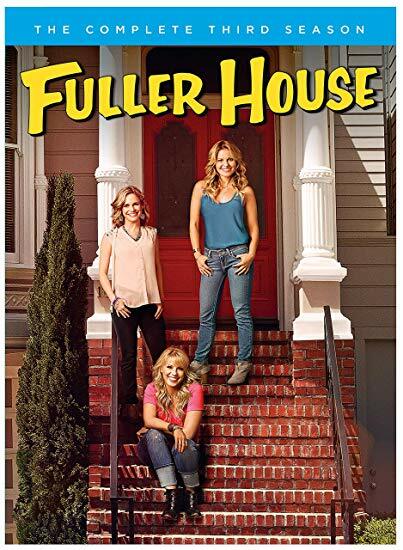 Fuller House: The Complete Third Season ~ Now on DVD! Major life events take place on the third season of Fuller House. Steve and C.J. make plans to get married in Japan, and the gang heads overseas for the big wedding. But before anyone has a chance to say “I do,” a big revelation has an impact on the nuptials. Plus, Stephanie makes plans to have a baby via surrogate, D.J. tries to get Tommy into a prestigious preschool, and Fernando buys Kimmy’s childhood home and restores it to its former glory. Meanwhile, Jackson and Ramona start high school where Ramona tries out for her school’s dance team while Jackson becomes a joke at his school after slipping on a piece of bologna during lunch. Joey, Jesse and Danny come home to celebrate 30 years since they initially moved in together to raise the Tanner girls. It’s an unforgettable season filled with laughter and love for the Tanners and their friends on this beloved family comedy. As the description above notes, there is a lot happening in Season 3! At times, it borders a bit on the side of slapstick (DJ's wrestling of a koi fish to expel the wedding ring it had swallowed was a little over-the-top), but I enjoyed watching the family's continuing adventures. In previous seasons, I thought that DJ's big decision whether to date Matt, the hunky veterinarian, or Steve, her childhood boyfriend, had been decided, but we discover in this season that she might be having second thoughts... Fernando is charming me more and more. In the first season, he seemed to be an irresponsible sort, but he's changing his ways and turning into a real family man and comedic star. As the de facto leader of this goofy family, DJ is doing a good job of keeping everyone (mostly) in line. And I love the musical numbers, especially the opening episode of Season 3 when Max has a dream prior to the start of his "Best Summer Ever"! I can't wait for Season 4 to discover what's next for the Tanner/Fuller/Gibbler families! P.S. Enjoy this peek at the upcoming Season 4! This post contains my Amazon affiliate link, and I will receive a small commission on purchases made through this link.